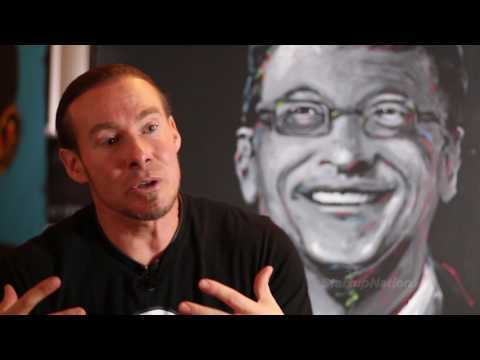 Watch as artist, entrepreneur and author of "The Spark and The Grind," Erik Wahl, speaks about defamiliarizing the ordinary and looking at things from a different perspective. "Defamiliarizing the ordinary is what allows us to push outside our comfort zone and create things that haven't been created before." One of my favorite Erik Wahl quotes, "Normal is boring, and normal is invisible." Erik's approach to his painting techniques is a great method to apply in the startup world. Consider how most would approach a situation or problem, and find a unique way to solve it. Not only will you set yourself apart, you might make some great discoveries, too. This guy is a crazy talented artist! Very inspiring to hear a creative talk about the startup world too. @foolishtees, Erik's creativity and different perspectives on things are a big reason why he is so successful -- as @Cara Boyer points out. And I agree, his talent as an artist is nothing short of unbelievable. Great quote, @Chris Nierhaus. If you're not daring to be different, or if you're using the same methods as others who have tried and failed, you're never going to get where you want to be. Never heard of him. Glad I clicked on this thread. Definitely gives a different perspective not only to artists but also businesses in today's world. I'm glad you found Erik's approach insightful, @BrotherJ! No matter the industry, I think all entrepreneurs can learn how to unleash their inner creativity through Erik's methods. Thanks for sharing, Ryan! To Be Different... this is a real struggle for many brands. Is it lack of creativity or too much that stalls the process? Sometimes, you think your idea is different only to find out that it has already been done. Then, if you go ahead and try to present a different version of a concept, you suddenly worry about intellectual property that makes you stop entirely. By the way, I've posted an answer for you re: request for links to StartupNation's content on the topic of disruption; saw that you've already shared one above, so thanks again. I think the topic of creativity and disruption are indeed challenging. Figuring out a way to stand out in a crowded industry, but also protecting your ideas, is often easier said than done. That's why I think Erik's philosophies on this topic are worth listening to. You may have an idea, but how do you make that idea successful? Trust the process, defamiliarize the ordinary and take risks, per Erik.